A group of 15 self- directed, artist/ printmakers make up the Open Studio in Printmaking at Hornsby College, Northern Sydney Institute of TAFE. This particular course conducted in purpose built facilities has been funded by student fees, and is planning to run again in 2013. Please contact Gary Shinfield for more information by email at Gary.Shinfield@tafensw.edu.au or leave a message on 94721586. 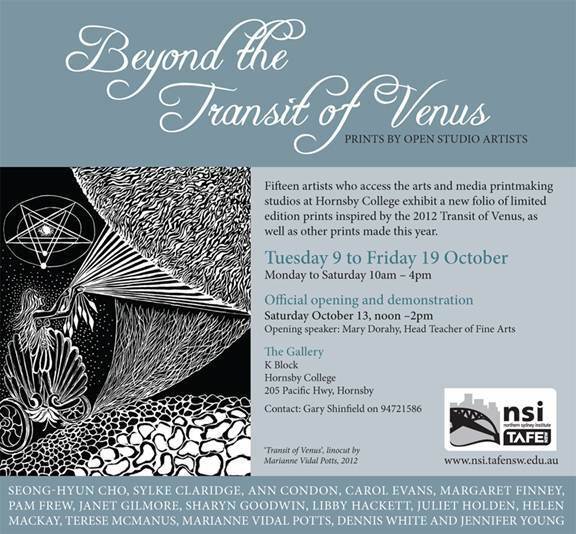 The artists will be exhibiting a new folio of limited edition prints, inspired by the 2012 Transit of Venus, as well as other prints made this year. These include linocuts, lithographs, etchings, woodcuts and screen prints. The opening has been timed to coincide with the Hornsby Arts Festival, on Saturday 13th October in The Gallery, K Block, 205 Pacific Highway, Hornsby between 12 and 2pm.